Since Michigan repealed its motorcycle helmet law in 2012, roughly one in four riders now choose to let their hair blow free. The annual cost of that freedom: roughly two dozen more deaths, scores of additional serious injuries and a huge spike in average medical expenses, according to studies of motorcycle crashes in Michigan. The numbers underscore what law-enforcement and medical data have shown for years ‒ that riders without helmets are more likely to die or suffer serious injuries in a crash than riders who wear helmets. “Non-helmeted motorcyclists more frequently died on the scene, spent more time in the intensive care unit, required longer ventilator support, and had higher medical costs,” concluded a third study, by Spectrum Health Butterworth Hospital in Grand Rapids. The bill landed in the Transportation Committee ‒ where five of seven members were among those who voted to repeal the helmet law. Democratic Gov. Jennifer Granholm twice vetoed repeal of that law before GOP Gov. Rick Snyder signed it into law on April 12, 2012, making Michigan the 31st state to let motorcyclists ride without helmets. Pohl told Bridge he has since been advised by his attorney not to discuss the case because of pending criminal and civil litigation. “These people just make things up,” Depends. The assumption is that a helmet protects from more serious injuries and so should be mandated to protect these guys (I don't use motorcycles.) But the data shows no change in deaths after 25% of the riders stopped using them. The correct analysis would recognize that those who eschew helmets are different; it's clear that they are a different breed that may actually have a higher accident and morbidity rate if they were forced to wear helmets. Just bypassing an unreadable rodomontade. Regarding the "no additional deaths" argument against requiring helmets. The number of deaths are not the only issue regarding motorcyclists without helmets. We all still must pay the enormous medical bills whether the rider dies...or lives as the additional insurance required of riders does not begin to cover hospital costs. In every case, this happens, and you know this as fact? It is a shame that the law makers in Michigan can not use common sense when enacting laws to keep healthcare costs down. Makes me wonder who got paid off to do such a stupid piece of legislation. Then the Governor who realizes that we need to spend more on out roads, makes a "Homer Simpson" move that will lead to more money spent on medical care. The Governor goes by the name "Nerd"? If nerds do things like this, then I want to be called stupid. I may have the time sequence off but, Michigan can not win with two branches of government helping out stupid ideas. A great article that clearly points to the flaws in the law allowing motorcyclists to make their own choices. Unfortunately most of those in the Michigan Legislature who voted for the bill along with Governor Snyder don't fully understand the implications of the law they changed. To blindly claim that data is unavailable showing the correlation between accidents and severe injuries/fatalities to unhelmeted riders is to ignore the many reports and statistics indicating otherwise, all to appease the minority voice of ABATE who feels that they represent every motorcyclist in Michigan. Three cheers to Senator Rebekah Warren to see the facts regarding motorcycle helmets. But Eric, the number of deaths, (an unimpeachable endpoint) didn't go up when 25% of riders stopped using helmets. The helmets made no difference. Apart from your intuition and the unsavory personalities of ABATE, the data show that nothing changed with the new law. These guys were slated to have a bad day no matter what was on or in their heads. It is too bad you did not read the 4th paragraph in this story, which contradicts your statement: "According to updated Michigan State Police data, roughly one-fourth of motorcyclists in Michigan now ride without a helmet. But helmetless riders accounted for nearly one-half of motorcycle fatalities in 2013, 59 of 128 deaths." Add to this is the fact that we ALL have to pick up the tab: "The annual cost of that freedom: roughly two dozen more deaths, scores of additional serious injuries and a huge spike in average medical expenses, according to studies of motorcycle crashes in Michigan." Amen. Yes, and I pointed out that non helmeted bikers were a breed apart, and may well self select themselves, (because they're overdosed on testosterone, members of certain bravura gangs etc.) that would reject helmets. These are the same guys who would have had a much higher accident rate in any case whether they were forced to use helmets than not. It may even be that helmets would have increased their accident rate. None of the data suggests otherwise. Just being skeptical about my fellow man and especially if he's an "expert", y'know. As you so pointed out and are oblivious to one glaring fact you overlooked “According to updated Michigan State Police data, roughly one-fourth of motorcyclists in Michigan now ride without a helmet. But helmet less riders accounted for nearly one-half of motorcycle fatalities in 2013, 59 of 128 deaths.” 59 of 128 deaths were riders not wearing a helmet! That means that 69 were wearing a helmet! Now not sure where you learned math but that is 10 more deaths by people wearing a helmet! One thing the article also fails to take into account is how many of those riders that died did NOT have a valid motorcycle endorsement! People that do investigate beyond just simply the whole numbers will find out over 50% of those had no valid endorsement, and there is a law to have a license to operate a motorcycle on the roads in Michigan. Numbers only can be manipulated to prove any number of arguments, but not to consider how many of those were inexperienced riders, ones with no valid endorsements, was alcohol a factor, those that were violating traffic laws, was another vehicle involved, road conditions, or any number of other factors then you are not looking at the whole issue here and that by its self is foolish. I have been riding for over 30 years and will be the first one to say there are some people that plain and simply have no business owning a motorcycle. And one other factor they FAIL to take into account is the number of riders on the road has gone up since then and as a whole the percentages are actually less not more. Know the true facts! I personally respect the motorcycle rider's right to wear a helmet or not, however, I don't feel that it should then impact the rest of us motorists regarding higher insurance costs. The freedom of the motorcyclist should end at their OWN wallet. $20,000 in medical insurance is a drop in the bucket for the medical costs incurred for accidents to motorcyclists. I suggest that $100,000 or more in medical insurance be a requirement as that is a more realistic cost, which would make insurance rates for vehicle motorists more reasonable since we should NOT bear the burden of the costs of THEIR freedom. Nothing but lies in this story. The so-called "rise in healthcare costs" ABSOLUTLEY CANNOT be attributed to folks who ride without a helmet, when obamacare has DESTROYED the healthcare system, and costs for EVERYONE have increased substantially. Typical liberal drivel from a company who advocates ALL liberal stances, no matter what the truth actually is. BTW, motorcycle fatalities OVERALL were less (one less) from 2012 to 2013. Bridge is nothing more than a liberal rag, promoting the liberal agenda, and NOT concerned with publishing the truth. If they can ride without a helmet why can't I ride in the car without my seatbelt? @Chris Excellent question. The moral hazard here is that we allow a certain segment to opt out of the social compact of using safety equipment but they are still able to draw upon the resources of the group (catastrophic medical claims coverage for motor vehicle accidents). A possibly better way to look at this issue is to allow people to ride without helmets, but then they automatically are exempt from the insurance pool. They can purchase their own coverage through a motorcycle group that promotes sans-helmet touring. The benefits would be to both groups, in that the lidless riders would reap the benefit of their perceived "safety" through lower premiums and the rest of us wouldn't have to subsidize stupidity. Right on Todd! I'm all for liberty, but freedom comes with responsibility. If we allow riding without helmets, or seat belts for that matter, then those individuals should be required to carry sufficient insurance coverage to cover the costs of the potential consequences, their personal medical care, surviving family members loss of income, etc. Your freedom ends before it gets into my wallet, just as my freedom ends before it gets into your wallet. I don't care if they want to ride naked! I just don't think it is fair for me/us taxpayers to cover the added cost for Castastrohic Claims nor added insurance costs. We all pay for them to take this chance without a helmet. Short Term thinking on the part of our Legislature to capture a fee to add to motorcycle endorsement on the Drivers License was simply new revenue. Money talks. The tax burden is real but seems so remote to people as unrecognizable. Check it out; car drivers pay about $200 into the Catastrophic CLaims Fund on each insured vehicle while the same cost for a motor cycle is only $25.00. Go figure. '“It’s not coming out of committee,” said chairman Tom Casperson, R-Escanaba. “I don’t see any support for it. My colleagues voted overwhelmingly (to repeal mandatory helmet use) so why should we vote on it again?”' Or: 'Why should we let facts, reality intrude on the myths we used to pass this?' Science, studies - not needed by the GOP; might unravel the myths. Like the $1.8 billion tax cut for businesses that would create jobs - yet no one can calculate how many were really created and MI has the 44th highest unemployment of the 51 states. How many of the permanently disabled helmet less riders ended up on Medicaid? Not mentioned in the article but that should be studied - but won't be in a GOP controlled legislature; again it might bring unwanted facts and reality to the debate (that doesn't exist in their mind). My car was rear-ended by a motorcyclist over the summer. Thankfully he was wearing a helmet, but he was injured, and even though he was found at fault for the accident, my insurance is having to pay for his medical treatment. So if he is required to have $20,000 of medical insurance, is it only used if he gets into an accident involving no other vehicle? Also, I had my 10-year-old son in the car at the time of the accident. If he had not been wearing a helmet, my son and I would have had a great deal more to deal with because the motorcyclist chose to exercise his freedom. Although it likely cannot be quantified in research, it seems that the explicit and implicit costs of wearing a helmet far outweighs the alternative, not only for the motorcyclist, but others as well. The 24 deaths is probably a drop in the bucket when compared to those who die because they smoke or are grossly overweight. The real problem is that those of us who try to live a relatively healthy life by not smoking, eating healthy, or avoiding excessively risky pursuits, usually end up subsidizing the insurance costs of those that don't. Then there are 2 schools of thought - one is that we can pass laws to protect everything and have lawsuits that punish those who produce products that stupid people use to kill themselves, and the second is that if we leave people alone when they are trying to kill themselves, then Darwin's theory of evolution will eventually wipe all stupidity from the earth. Neither is true, so I would be content to create insurance pools that contain helmetless motorcycle drivers, smokers, and overweight people. I'm not clear; are motorcyclists covered for health insurance costs and disability under our No-Fault system? Don't auto owners pay a significant premium for this coverage? What do cyclists pay for their licenses, and does it cover the cost of no-fault coverage if that applies? Motorcycles are exempted from the no-fault auto law. So they do not receive lifetime health benefits for their injuries on a motorcycle. UNLESS an automobile or truck is also involved in the accident. When this is the case a motorcycle rider does benefit from all the coverages under the no-fault insurance law. To expound, If the motorcyclist is in a crash with a car or truck, the auto insurance policy pays for the injuries of the motorcyclist, no mater who is at fault! This is one of the least surprising headlines I've seen today. I have no problem if motorcyclists choose to not wear helmets. I think it's asking for trouble, but whatever. I do think though that motorcycles should somehow be designed to incessantly beep for helmetless riders like my car does when I don't wear my seatbelt. That seems about fair. I always wear a helmet when I ride. I respect fellow riders that opt to make a different decision. I always wear a seat belt when I am in a vehicle (driving or riding). I respect others for making different choices and believe the law should respect their right to make a different choice. In both cases, I urge others to follow my example of using safety equipment to be safer. Not safe. No one is ever safe. Just safer. This issue goes right to the question of the proper role of government in private lives. Samuel Adams said it most correctly: "If ye love wealth better than liberty, the tranquility of servitude than the animated contest of freedom — go home from us in peace. We ask not your counsels or arms. Crouch down and lick the hands which feed you. May your chains sit lightly upon you, and may posterity forget that you were our countrymen!" If the problem is the impact on public health spending, then stop spending government money on public health insurance. Leave it to private charities and voluntary contributions. A truly Christian nation would never want for private provisions for those in need. Dan, Great comment, and I totally agree! Charities have plenty of opportunities to help people who are in trouble without adding the extremely expensive medical bills of motorcyclists who decide not to wear helmets. Motorcycle riders who do not wear helmets appear to have a very broad concept of liberty to include not only the right to ride a motorcycle without a helmet but also a right to impose huge costs on the taxpayer when they become injured, require hospitalization, and their insurance benefits are exhausted, and/or become disabled and apply for and receive Social Security disability benefits (if they qualify). These riders are asserting both a negative right (government cannot compel me to wear a helmet) and a positive right (the taxpayer/hospitals/Medicaid/others should pick up the tab when I'm injured, require hospitalization, and exhaust my insurance benefits). You can whine all you want about motorcyclists not wearing helmets but the fact of the matter is, there are thousands more deaths and disabilities due to head injuries during automobile accidents every year. Insurance is only possible by everyone or alot of people paying and only a few collecting from it. You can argure that more cars are on the roads than motorcycles and this is why auto accidents cause more deaths and disabilities but it does not change the facts, should all car drivers wear a helmet? First off if you ride without a helmet you should rethink that. Some of the reasoning for that law was we loose tourist dollars because they won't come to Mi. When someone is injured or killed in an accident everyone looses and pays in some way. Don't depend on our Reps. to change that. If you don't want to wear a helmet that's O.K. just stay in the house or don't come to mi. R.L. Common Sense and Logic says a Helmet, Leathers and Boots will protect my body just like Seat Belts and Air Bags. Fear and Ignorance says No Government can tell me how I can ride. I am free to do as I please no matter the consequences. Wear a helmet, don't wear a helmet. Just don't send the medical bills to me. Sen. Casperson doesn't believe statistics unless he creates them, and even if the law were changed don't expect him to follow it. Just see his comments on: Wolf hunting We have the best government that money can buy. When I am stopped by police, the first thing they ask for is proof of insurance and my registration. Has any motor cyclist been cited for not having proof of the extra insurance? What is state police protocol when a cyclist has neither a helmet or extra insurance? How do the police deal with out of state riders without helmets? You touched on a point not appreciated by the other commenters. When some insurance requirement is required to ride without a helmet, how are the police to know whether the motorcycle ride has the required insurance or not? They cannot pull someone over just to check. The only time the police can check is either after the motorcycle rider has been pulled over for some violation separate from the helmet issue or after an accident. The police can only ask for proof of insurance after a legal stop. The cannot ask to see proof of the additional coverage. A retired orthopedist I recall the lower numbers of deaths with seat belts and helmets. I know I gave the best care I could to insured and not insured. If those who fail to use helmets have a higher propensity for injury should they not have a rider on their insurance to cover additional costs or a card saying no brain surgery if squash is squashed. No reason not to have a right to be "free" but don't lay the cost on others. So should those who persist in smoking or vaping Los carry a rider for care if they get cancer. Governor Snyder (whom I generally support) made a bad decision when he signed this law. The law itself should have required $100,000 rather than $20,000 in insurance, and should have contained a contingency clause that would have adjusted the required insurance based on actual experience. Further, it should have contained a clause that would have automatically repealed it if fatalities and severe injuries increased by more than a specified number above the average of the five years preceding passage. Senator Casperson and Jim Rhoades from ABATE should be asked how many additional deaths above the average of the five years preceding repeal would persuade them the law should be repealed. Our legislature will make it's decisions based on the wants of the lobbyist group they want to work for after they get term limited out. Medical costs incurred by a motorcyclist, as the result of injuries suffered from a motorcycle accident, are covered under the motorcycle insurance policy, capped at $20,000; the insurance premium is paid for by the motorcyclist. The exception to this is when an automobile is also involved in the motorcycle accident, than medical costs for sustained injuries are covered under the automobile policy. The automobile insurance underwriters factor this risk into the automobile insurance premiums that we pay. 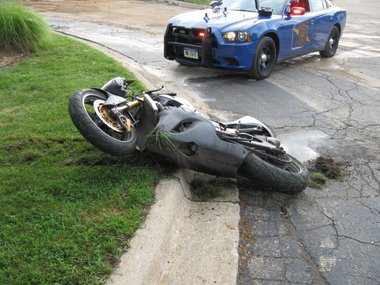 In 2012 266,489 motorcycles were registered in the State of Michigan. According to this article, 129 deaths occurred in Michigan in 2012, which, if I am doing my math right, reflects a mortality rate of .04%. I do not support any legislature that writes laws with the intent to restrict my lifestyle choices. Arguing that the restrictive law is acceptable because it meets some arbitrary financial threshold does not alter my supportive stance of personal freedoms. Many good replies, unfortunately it doesn’t much matter. To politicians all issues are about money and votes. How much can a special interest group (like ABATE) stick in my pocket and or how many votes can they get me? Unfortunately that is all most of our elected officials care about. You do not have to be a genius to realize that riding without a helmet would result in more deaths and life changing brain injuries than if you wore a helmet. The same can be said for seat belts and air bags in cars but there are more special interest groups with big money always pushing for more safety in cars. The Insurance Institute is just one of those. The added cost for safety, added on or into the design of cars is huge and more is coming, but you have no choice but to pay for it, it is mandated. The politicians were paid to require it on your car. Riding a motorcycle without a helmet should require insurance to be increased to the amount needed to provide medical care for a brain damaged rider until his death. That means a young motorcyclist would need to be insured for about a million dollars and less for an older rider based on actuarial tables of expected years left to live. $20,000 is nothing today, that means the rest of us have to pay the costs above that. Bottom line: no one should have to pay for someone else’s stupidity. P.S. I feel so sorry for Karl Pohl and the many others who are left to deal with the grief of that decision. In the medical transplant field, they call them "donorcycles." I know a man who wore his here and when he visited back home in Ohio, which also permitted helmetless riders. He's a member of Mensa but one does not need that high of an IQ to be smart enough to wear them. With a (now adult) daughter who is a Taurus, I picked my fights carefully. I won the one to get her to keep wearing her helmet when on a bicycle. She recently told me that it saved her a minor head injury. It also makes her a good example to the children for whom she babysits. I've worn mine into the house and realized, 15 min. later, that I still had it on--they are NOT uncomfortable. As an ex-motorcyclist and the operator of a personal automobile I think it is fine if motorcyclists have the freedom to not use helmets, but they should carry full medical coverage, without a maximum limit, and no longer be exempt from the "no fault" insurance and should be no longer able to sue an automobile or truck driver if they are involved in an accident with a motorcyclist. Right now motorcyclists can sue and receive damages even if they are at fault, which is why during the seasons when motorcycling is possible we see ads from trial lawyers wanting to represent motorcyclists involved in accidents. These are the only accident cases involving motor vehicles that are left for "Accident Chasing Attorneys." Getting rid of auto accident lawsuits is why we have the Michigan "No Fault System" even if it costs us a bit more we don't wait for years and the courts to decide who should pay damages and how much any more. Motorcyclists want to take increased risks but they shouldn't put other drivers at risk for paying for their injuries that result from their "freedom!" I wonder how this will impact motorcycle sales over time. I foresee insurance rates increasing and increasing for motorcyclists (at a rate higher than Auto). At some point the insurance premium will be higher than is affordable. If or when that happens, will the rate of cyclists riding uninsured increase? Those law abiding cyclists would either lay the higher rate or sell their bike. In the end will they buy bikes? Will the manufacturers lay off workers if sales decrease? I may seem to have a lot of questions but I have already answered the question in our law abiding, helmet wearing family---sold the Harley and will not be buying another. Sorry Harley worker. Like others have said before, people in cars must wear seat belts, those on motor cycles need to wear helmets. Utilizing Michigan roads is a privilege not an exercise right in individual freedoms. That is why we have speed limits, stop lights etc. I know that some will say all this is not needed and people can do whatever they want on the roads but come on 99% of us know that there needs to be rules and regulations on the road and wearing helmets should be one of them. Finally, as so many have put it, the vast majority of us should not have to pay for the stupidity of the few and if some organizations want to promote no helmets, then you pay for all the additional health/medical costs that come with it. The people that ride without helmets should be required to have a minimum of $250,000 in insurance as well as completing an organ donor card for all organs that can be harvested with the exception of their brain. The brain is exempted because if theirs was any good they would have been wearing a helmet. Let's try a different approach. Let the bike riders have their choice, but they need to recognize the impact they have on others. Modify the law to require that each bike rider have a letter, on their person, that is signed by each family member and friend that cares for them and will suffer if they have an accident and injuries contributed to by no wearing a helment. The letter would give specifical approval for the rider not to wear a helment, that the signees do recognize that risks associated with not wearing a helmet, that the accept how their lives and emotions will be disrupted by such injuries, that the children accept that their lives will be changed forever and the barriers to their success will be greater, that the parents lives will be changed and they will be involved in caring for the family left behind or participating in the injured riders care, the significant other will have their life changed forever and they will accept the added burden for the care of the bike rider, that friends and family will accept the lose of past actitivities, etc. For those that die it is the ones left behind that suffer most. For those that care for injured have currently have no say in the changes they will have to make, so those are the ones who should being making the decision more than the rider. This would apply each person who does not wear a helmet and rides a motorcycle, or scooter. How many people would ask for such approval from family and friends if it were about not wearing protective equipment at work to exonerate the employer from safety responsibility? What is the difference, the risk of injury and the potential severity is similar? The issue is dead as are many of the ABATE members. Thank god for Darwin. Eventually this level of ignorance will be culled out of the herd eventually. It is unbelievable that Senator Casperson is unaware of any definitive studies that show a link between helmet use and safety. This evidence is overwhelming and readily available. And for Mr. Rhoades to say “These people just make things up,” is even more astounding. It is the combination of the denial of the facts by those opposed to helmet laws and the choice by our elected officials not to look for facts that results in public policy decisions based on personal and/or political positions rather than research, logic and common sense. A good place to start to access the research is: http://www.smarter-usa.org/education/ The “New” posting you will find here is a recent special edition of the association’s newsletter that high-lights several recent reviews of the literature providing connections to HUNDREDS of individual studies. And exactly how many of the accidents were caused by cagers while using their cell phone... Texting, talking, looking at GPS, etc.? As a Michigan taxpayer, are you willing to indulge a small minority of motorcyclists who choose to ride without a helmet by underwriting the massive expenses incurred if such a rider suffers a traumatic brain injury while riding? There is overwhelming evidence that wearing a helmet reduces the severity of head injuries if a motorcyclist crashes or is hit by another vehicle. It seems a vocal and often poorly informed minority of motorcyclists value their freedom to ride without a helmet at the expense of the majority of Michigan citizens. They have freedom to choose and the rest of us have no freedom regarding State payment of their medical bills if they incur a TBI while riding. Rights and liberties being stripped away. And all people think about is money. Pretty sad !!!! I've ridden motorcycles and bicycles for many years and have had accidents with both. There is little chance that your head will not be involved in an accident with either. It is a simple matter of leverage that you have no control over in an accident. I completely understand the whole 'hair blowing free' thing, but when your hair is blowing free and you have the misfortune of an accident, the laws of physics are going to take over. The resultant increase in serious head trauma and extended care are just as predictable. We're all paying more for a law that defies simple physics. The true stat's will never be known on if wearing a helmet helps or not because just like seat belts, the Government never put's out all the findings. Just like with car accidents with fatality's they only mention the seat belt if it was not being worn. They never tell you how many people die each year that were wearing them. I myself think over the age of 21 you should have the choice if you want to wear one either as a rider or as a passenger. PUT IT TO A PUBLIC VOTE,,,,and tho's who do not ride have no clue where WE WHO DO are coming from with our options on this subject. I feel also the town's that allow the street legal golf carts on the road those people should have to wear helmets also, they are no more protected then someone on a bike. I personally think helmets save lives.I choose to wear one for protection, but at the same time I think adults should be able to decide for themselves.If the law changes I’ll still be wearing mine. Regards, Ankit Z. This study was done in Michigan before the law changed Hospital Cost Is Reduced by Motorcycle Helmet Use M. M. Brandt, MD, K. S. Ahrns, RN, C. A. Corpron, MD, G. A. Franklin, MD, and W. L. Wahl, MD The Journal of TRAUMA, Injury, Infection, and Critical Care, 53(3) 469-473. Copyright © 2002 ABSTRACT Background: The purpose of this study was to identify the impact of motorcycle helmet use on patient outcomes and cost of hospitalization, in a state with a mandatory helmet law. Methods: Patients admitted after motorcycle crashes from July 1996 to October 2000 were reviewed, including demographics, Injury Severity Score, length of stay, injuries, outcome, helmet use, hospital cost data, and insurance information. Results: We admitted 216 patients: 174 wore helmets and 42 did not. Injury Severity Score correlated with both length of stay and cost of hospitalization. Mortality was not significantly different in either group. Failure to wear a helmet significantly increased incidence of head injuries (Students t test, p < 0.02), but not other injuries. Helmet use decreased mean cost of hospitalization by more than $6,000 per patient. Conclusion: Failure to wear a helmet adds to the financial burden created by motorcycle-related injuries. Therefore, individuals who do not wear helmets should pay higher insurance premiums.